Washington law states: "Every bicycle when in use during the hours of darkness...shall be equipped with a lamp on the front which shall emit a white light visible from a distance of at least five hundred feet to the front..."
The law defines darkness as "a half hour after sunset to a half hour before sunrise." Because the statute states "every bicycle shall be equipped with a lamp" a helmet-mounted light alone would not comply with the strict interpretation of the statute. Furthermore, a red flashing tailight alone may not strictly comply with the statute either. Based on the wording, it appears that the primary purpose of requiring bicycle lights is so that motor vehicles can see you, not necessarily so that you can see. Although the law only requires that bicycle lights be used during the defined hours of darkness, "being seen" is just as important during the day as it is at night. I have investigated hundreds of bike/car incidents in the Seattle area. The common thread in nearly every one of these incidents is that the car driver was not aware of the cyclist until it was too late and often not until the moment of impact. The most common accident involves a left-turning car driver who simply does not see the oncoming cyclist. Awareness is the key. Cyclists simply do not have the mass or size of a car and are essentially invisible to motorists. Furthermore, there are not enough cyclists on the roads to make an impact. The everyday car driver is not accustomed to seeing cyclists on the road and, therefore, cyclists are not on the driver's radar screen. 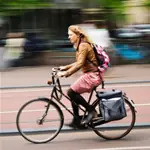 If a car driver only sees the occasional cyclist, he does not have a heightened awareness or an anticipatory thought process -- "Before I change lanes, I better look over my shoulder to see if there is a cyclist to my right." Or, "Although there are no cars approaching, I better scan to check for cylists." Until there is a dramatic increase in the number of cyclists sharing the road with cars, this automatic, reflexive thought process on the part of motor vehicle drivers will not occur. Besides encouraging everyone we know to commute by bike, what can cyclists do to immediately raise awareness? The answer: Buy a strobe and use it as a daytime running light. I have had a small LED strobe on my bike for about a year, but until most recently, I only used it at night. Motorcycles are required in many states to have their headlamp on during daylight hours and most new cars have headlights that automatically come on when the car is running. The logic is simple. While daytime use of such lights does not help a cyclist or motorcyclist see any better, it dramatically increases the cyclist's visibility to others. John Duggan is an avid cyclist and Seattle attorney who represents injured cyclists. He can be reached at 206-343-1888 or john@dugganbikelaw.com.